October 2017 – JNE is a long and meaningful journey filled with plentiful stories of its employees in carrying out the duties of delivering packages to JNE loyal customers and Indonesian people as a whole. JNE started all the business from scratch with only four employees. JNE has now grown up and become a multinational company with over 6000 networks across the country. Those networks consist of 40.000 employees; head office employees, main branch employees, business partners and of multiethnic ties and multiple spoken languages. It has been the norm for JNE to annually celebrate its anniversary on November since the first time it is established in 1990. During the celebration, JNE always create a series of programs and events that cover many aspects of life in the community. This year, JNE turns 27 and the company comes up with a special theme namely “Coloring Indonesia”. The theme means representing JNE as an established and Indonesian owned company which has strong vision to contributes to the nation and reflects the rich diversity of Indonesian people. 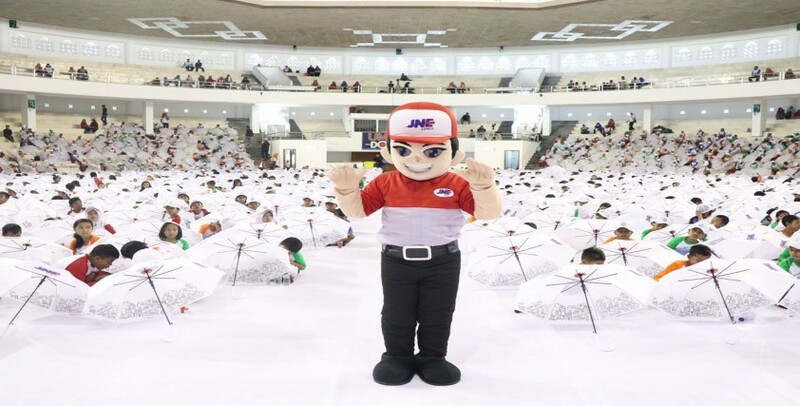 The manifestation of the theme is expressed in the main of The JNE 27th Anniversary in the form of Breaking The Indonesia World Record Museum (MURI) for Coloring 1270 Umbrellas. The numbers of colored umbrellas in that record is chosen for a reason because it contains the figure ‘27’ which is the age of the company in 2017. The event was held on Monday, October 22nd, at 08:00-12:00 local time in UMM Dome, Malang, East Java and participated by local primary school students aged 7-11 years old. The JNE President Director, M. Feriadi during the event explained that for 27 years JNE has connected distant regions and encourage local potential in areas previously experienced logistic problems. More specifically, in this era of rapid growing e-commerce, the presence of JNE helps to accelerate economic growth in many areas. “Despite JNE`s role as an express and logistic shipping company, JNE has the spirit and enthusiasm to build the nation. Thus, JNE actively participates in any social and humanity activities.” said Feriadi who attend the event along with other board director and The JNE Malang Branch Manager, Windhu Abiworo. Malang becomes the host of the event because it has strategic location which is in line with the theme of the anniversary this year namely Kampung Warna warni Jodipan. Creative industry growth in Malang also shown positive development which is parallel to JNE`s policy as a partner of SMEs in Indonesia. A representative from The Indonesia World Record Museum or MURI grants JNE the award after totaling the number of umbrellas colored in UMM Dome, Malang. Some of the umbrellas were brought and put in Kampung Warna-warni Jodipan, Malang. The latter location also become the place of Press Conference: JNE 27th Anniversary “Coloring Indonesia” on the same day at 14:00-16:00 local time. Besides breaking MURI record and conducting The JNE 27th Anniversary Press Conference in Malang, JNE on the same day also do story book and reading materials donation and shipping for Playgroup and Kindergarten in need. There are 11 thousand educative books in total gathered from the donation and the donation are then distributed freely in 11 cities and their nearby areas. Those books are delivered through JNE Main Branch in East Java, Bali, West Nusa Tenggara, and East Nusa Tenggara. The books are then distributed further in JNE Branches in JNE Kupang, Mataram, Denpasar, Jember, Probolinggo, Pasuruan, Malang, Kediri, Madiun, Mojokerto, and Surabaya. Previously, one of the programs in JNE 27th Anniversary program and events series invited all entrepreneurs in 18 cities to attend a free workshop and seminar entitled “JNE Ngajak Online”. The workshop and seminar provides training for SMEs to generate quality and marketable products which is conducted in 18 cities; Tanjung Pandan, Bengkulu, Sorong, Jayapura, Samarinda, Palangkaraya, Banda Aceh, Jambi, Bontang, Tarakan, Palu, Manado, Gorontalo, Ambon, Pangkal Pinang, Cilegon, Kupang, and Mataram. JNE also held “JNE Ngajak Ngirim” a free of charge shipping program which valid for a day right after completing “JNE Ngajak Online”. The free shipping program applied in 18 cities where “JNE Ngajak Online” is held with one shipping destination only that is to Jakarta. The program does not stop there, with the aim to optimally support local SMEs to enter and compete in global market, JNE has provided JNE International Service which capable of distributing customer packages to over 250 countries in all continents in the world. Other programs and events in many sectors have been initiated across the country earlier this year before The 27th JNE Anniversary series of programs and events commenced. For instance, Training Seminar called Indonesia Marketing Festival and Gebyar UKM in collaboration with Markplus Inc. In 15 cities. Also, Kampus Shopee Roadshow in 13 cities by cooperating Shopee, a leading online marketplace which started from February to November 2017. A series of seminar, Corporate Social Responsibility (CRS) Programs and other activities were conducted in the half year of August and are going to continue until the end of the year. Besides “JNE Ngajak Online”, another workshop namely E-Commerce Vaganza for SMEs also supported by JNE and held in cities. As for CSR programs; Cleft Lips Surgical Operation in Sabang, Aceh with Smile Train, Donation and Distribution of hundred educative books for children in Lombok, West Nusa Tenggara which is conducted with Taman Bacaan Anak Lebah, and also distribution of school equipment for children in need through “Rajut Kasih” program. The CSR program in 2017 is even more special because it coincided with The 72nd Indonesian Independence Day. JNE collaborated with Bandung Mayor in revitalizing and inaugurating Cikapayang Dago Park, located at JL. Ir. H. Djuanda No.79, Bandung – East Java 40132. This Proved JNE active participation in assisting the government to transform healthy, creative, and clean society through provision of more open spaces. Breastfeeding working mothers also received special attention from JNE series of program this year. It is due to ‘Jesika Office to Office’ program along with Smart Mama Community is held to help them alleviate the burden. 10 leading company offices in Jakarta become the location of educative seminar from one of JNE product services called JESIKA (Jemput Asi Seketika/Instant Breast Milk Pick up Service). The educative seminar is attended by experts and specialists, held in offices to educate female professionals or emplloyees who are breastfeeding mothers at the same time. Last but not least, regular agenda to appreciate JNE loyal customers who are affiliated in JLC (JNE Loyalty Card) members. JNE Management and Best JLC Members organized JLC Gathering as a Group Discussion Forum in 7 cities. Digital Era which is full of potential also provides lucrative opportunity for SMEs to develop their businesses, the same is true for all JLC members in many cities. A lot of JLC members who are also entrepreneurs and previously only had a few points due to insignificant number of shipping made has now become the best member and able to generate considerable package shipping every month. Such successful story can be traced by JNE Management and found in areas such as Cilegon, Magelang, Cirebon, Kediri, Jambi, Pontianak, and Manado. Through this discussion group forum, it is expected that JNE service quality in JLC Program can always be improved and as a consequence keep empowering the business development and expansion of its member in the long run.